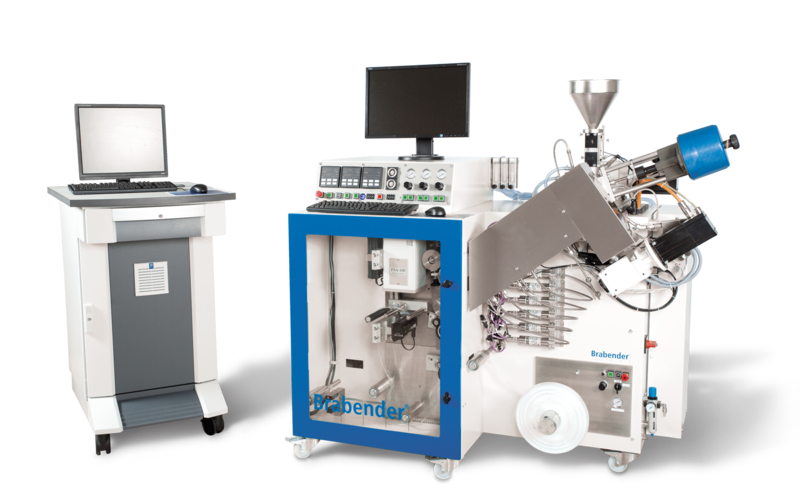 The Auto-Grader continuously determines the melt flow rate, film purity, and transparency - within seconds on-line with polymer production. The Auto-Grader continuously determines the melt flow rate, film purity, and transparency - within seconds on-line with polymer production. Self-optimizing and automatic operation ensures optimum adaptation to the polymer to be tested. All relevant data are stored in a database and can be transmitted to a process control system. When production changes over to a new charge, the Auto-Grader® allows to exactly determine the time when the product meets the specification. This minimizes the portion of "out-of-specification" material. State-of-the-art Windows™ software allows visualization of all data on a single monitor. The system is open to expansion for running further on-line measurements, e.g. of color, haze, density (NIR), etc. A standard Ethernet port is provided for connection to a modern process control system. An optional serial RS 232 can interface to a host computer for monitoring all data in a control room of the production plant. Alarms concerning the specification limits of the product as well as machine alarms can also be connected to the control room.